All off-season, this was the game I wanted to see. In 2012 Georgia was 5 yards away from playing for a national championship and Clemson finished on a high note, upsetting LSU in the Chik-fil-A Bowl. This game was a duel between two of the top quarterbacks in the country, Aaron Murray of Georgia and Tajh Boyd of Clemson. Both teams also lost crucial players to the NFL, so I wanted to see how the two teams would respond. The two teams did not disappoint, scoring 73 combined points and racking up over 1,000 combine yards. Clemson struck first on their second possession of the game. After a 25 yard completion to wide receiver Charone Peake, Boyd ran it in from 4 yards out to take a 7-0 lead. Georgia answered right back on the next play from scrimmage. Super sophomore running back Todd Gurley took off on a 75 yard touchdown to tie the game. Things got even more frenetic when Clemson scored on their next play from scrimmage with Boyd connected with Sammy Watkins from 77 yards out and Clemson went back up 14-7. That was three touchdowns in 34 seconds. Murray was not about to give up, moving his team 75 yards in 11 plays and running back Keith Marshall took it in from 4 yards out to again tie the score. After a Tiger punt pinned Georgia their 3 yard line, Murray again led his team on a long touchdown drive. This drive went 97 yards in 10 plays and took 4:20 off the clock. Sophomore fullback Quayvon Hicks started the drive with a 37 yard run to get the Bulldogs out of the shadow of their own goal post. He was rewarded at the end of the drive with a 1 yard touchdown run to put the Dawgs on top for the first time at 21-14. The scoring slowed down a bit at this point. Neither team was able to do much offensively early in the 2nd quarter. However, things changed when Aaron Murray fumbled on his own 20 after being sacked by linebacker Stephone Anthony. Linebacker Spencer Shuey fell on the ball and the Tigers had the ball in scoring position. Boyd drove them inside the 5 yard line, then scored from 2 yards out. The game was now tied at 21. Georgia failed to capitalize inside of 3:00 left in the half when Watkins fumbled a punt at his own 30 yard line. On the next play, Murray was intercepted by defensive end Corey Crawford to end the threat and the score remained tied at 21 at the half. Clemson struck first in the second half. On their first possession, Boyd threw a perfect strike to running back Zac Brooks for a 31 yard touchdown and Clemson was back on top 28-21. The Bulldogs continued to fight back. After failing to get a first down on their next possession, Georgia coach Mark Richt rolled the dice and called a fake punt on 4th and 1 at his own 39 yard line. Punter Collin Barber ran for 5 yards and it energized the Bulldogs. Two plays later Hicks struck again, taking a short pass and rumbling 38 yards down the right sideline. He fumbled at the end of the play, but receiver Chris Conley alertly fell on the ball. Gurley scored on the next play and the score was tied again at 28. On Clemson’s next possession, Boyd drove them to the Georgia 7 yard line. The drive stalled and they settled for a field goal to take a 31-28 lead. On Georgia’s next possession, they had a chance to tie the game, but failed to capitalize. Murray drove his team to the Clemson 2 yard line, but 3 straight runs came up short. On 4th down, the Dawgs set up for a field goal, but the snap was high, the ball was bobbled and they were unable to get the kick off. The third quarter ended with Clemson still clinging to a 31-28 lead. With 7:40 left in the game, the Tigers scored again, this time on a pass from Boyd to tight end Stanton Seckinger and Clemson now had a two score lead. Georgia could not do anything on their next possession, but after a Clemson punt, Murray quickly moved his team downfield. Murray went over the top from 1 yard out with 1:06 left to cut the lead to 3 points. The Bulldogs attempted an onside kick, but Clemson receiver Martavis Bryant fell on the ball and the Tigers ran out the clock to get the win 38-35. Some may point to Aaron Murray’s failure in another big game, but Murray played pretty well. He did have a fumble that gave the Tigers 7 points and his interception stopped a Bulldog scoring threat. However, he completed almost 70% of his passes and he had over 300 yards passing. The game came down to Georgia failing to capitalize on opportunities. After Watkins’ fumbled punt put the Bulldogs in scoring position, Clemson’s defense confused Murray and he threw a pick. The bobbled snap on the field goal was a back breaker that the Dawgs could never recover from. Georgia will now have a tough home game against South Carolina. This is a must win game for them if they want a chance to win a championship. Clemson, on the other hand, gets a much easier matchup. South Carolina State will visit Death Valley this week. 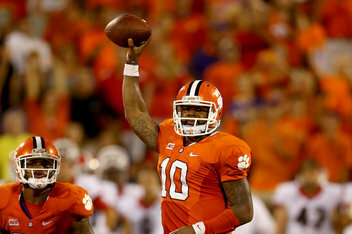 Tajh Boyd, QB, Jr: Beginning his third year in the system. Experienced and able to make checks at the line of scrimmage. Improvises well. Nice pocket presence. Patient runner. Extends plays. Likes to attack the defense. Completed 18/30 for 270 yards and 3 TD. Ran 13 times for 42 yards and 2 TD’s. Roderick McDowell, RB, Sr: First year starter. Paid his dues. Looked good in his first start. Good vision and cutback ability. Runs hard. Finds creases in the defense. Good jump cuts. Nice outlet receiver. Ability to spin out of tackles. Had 132 yards rushing on 22 carries. Had a long run of 36 yards. Had 1 catch for 10 yards. Charone Peak, WR, Jr: Had a good game. Looked good on screen passes. Runs well once he makes the catch and has good second effort. Had receptions to covert 3rd down and 4th down situations. Had 5 catches for 58 yards. Martavis Bryant, WR, Jr: Had a tough night as a receiver with multiple drops. Physically gifted, but needs to work on his concentration. Redeemed himself by recovering the onside kick to seal the win. Sammy Watkins, WR, Jr: Showed his breakaway ability on 77 yard TD catch. Amazing body control. Also a threat to run the ball on sweeps and returns punts and kicks. Caught 6 passes for 127 yards and 1 TD. Had 1 dropped pass. Carried the ball 2 times for 2 yards. Fumbled a punt. David Beasley, G, Jr: Showed good movement skills. False start penalty. Vic Beasley, DE, Jr: Former high school running back. Undersized at 230 pounds. Makes up for size with very good strength and exceptional quickness. Very athletic. Had 2 tackles, 2 tackles for loss, 2 sacks (one of which was on 3rd down) and 1 QB hurry. Grady Jarrett, NT, Jr: Good pass rusher. Good hustle and doesn’t give up on a play. Had 6 tackles and ½ tackle for loss. Corey Crawford, DE, Jr: Showed good athleticism, dropping into coverage and picking off a pass. Returned the interception 18 yards. Had 1 tackle, 1 sack and a strip of the quarterback. Quandon Christian, OLB, Sr: Good blitzer. Gets his hand up while rushing the passer. Gets penetration in run support. Had 3 tackles and 1 batted ball. Stephone Anthony, MLB, Jr: Plays the run well. Had a nice stop of Hicks at the goal line. Had 7 tackles, 1 tackle for loss, 1 sack and 1 forced fumble. Spencer Shuey, OLB, Sr: Versatile. Plays the run well. All over the field. Good special teamer. Downed a punt inside the 5 yard line. Had 12 tackles and a fumble recovery. Aaron Murray, QB, Sr: Intelligent and experienced. Making his 42nd career start. Pocket passer that is trying to become more of a threat running the ball. Poised in the pocket. Played better in the 2nd half. Never gave up and continually brought his team from behind. Had a big drive in the final minutes to cut the lead to 3 points. Completed 20/29 for 323 yards. Had 1 fumble and 1 INT. Had a rushing TD on the last drive. Malcolm Mitchell, WR, Jr: Former cornerback. Big play receiver. Able to return kicks. Injured his ACL during a touchdown celebration and is out for the year. Michael Bennett, WR, Jr: Dependable and sure handed. Great chemistry with Murray. Makes tough catches. Had 5 catches for 60 yards with a long of 22 yards. Rantavious Wooten, WR, Sr: Good hands. Snatches the ball from the air. Knows how to get open. Determined runner after the catch. Had 2 catches for 46 yards with a long catch of 33 yards. Chris Conley, WR, Jr: Good breakaway speed. Heads up player that saved his team with a fumble recovery. Had 3 receptions for 67 yards with a long catch of 35 yards. Arthur Lynch, TE, Sr: Powerful runner after the catch. Had a quiet, disappointing game. Only had 1 catch for 18 yards. David Andrews, C, Jr: Had a tough night with two penalties. One for false start and one for holding. Chris Burnette, G, Sr: Pulls well. Good kickout blocks. Kanarious Gates, OT, Sr: Struggled with speed rush. Whiffed on a block on Vic Beasley, resulting in a sack. Garrison Smith, DE, Sr: Very active. Gets good penetration. Had 4 tackles and 1 tackle for loss. Ray Drew, DE, Jr: Puts good pressure on the QB. Sets the edge well in the run game. Had 4 tackles and 1 tackle for loss. Amarlo Herrerra, ILB, Jr: Always around the ball. Good pass defender. Reads the QB, breaks well on the ball. Pursues all over the field. Had 12 tackles, ½ tackle for loss, and 2 pass breakups. Connor Norman, SS, Jr: Better in the box than in coverage. Was beat deep for a 31 yard TD. Battler that doesn’t give up. Broke up another possible long completion. Had 8 tackles, ½ tackle for loss and 1 pass broken up. This entry was posted on September 3, 2013 by draftmaniacs in Scouting reports and tagged Aaron Murray, Chris Conley, Clemson Tigers, Collin Barber, Corey Crawford, Georgia Bulldogs, Keith Marshall, Martavis Bryant, Quayvon Hicks, Sammy Watkins, Spencer shuey, Stanton Seckinger, Stephone Anthony, Tajh Boyd, Todd Gurley, Zac Brooks.